Chapter 12: "How Does Her Garden Grow?" Summary: A meeting of old friends (and enemies). The Story So Far: The Crusaders mount a new Operation Mi'ihen in an attempt to save Djose Temple's aeon, to no avail. Auron, guarding Summoner Isaaru, is felled by lightning during Sin's attack. The sky was singing. No, not the Hymn of the Fayth. It was a simpler lullaby, rocking with the ocean's rhythm, a tune suited to a child's cradle on some lush tropical island where the afternoons were drowsy and sweet. Auron wondered what had put that image into his mind, monastery-raised as he was. A nun had sung over him once, laving his fevered brow while he lay on a hard pallet fighting sickness after spending the night on Lake Macalania for the sake of a dare. The hand stroking his brow paused. "I don't think I'd like being a nun, Auron." He opened his eyes or his mind— it was the same thing in Sin's in-between world, this web of dreams and memories halfway between Spira and the Farplane— to darkness and the glimmer of Lulu's shoulders. Her arms were bare, but she was clad this time in something approximating her formal black gown, a strange blend of minx and mourning attire. The belts of her skirt were more tightly-woven, showing no flash of skin. Her hair fell in a wild mass to the ground, mingling with the bed of vines and briars where he lay. The perfect line of her jaw made him want to compose a catechism, and he choked on his own laughter at the ridiculous sentiment. She laughed with him, lips curving in that rare unguarded smile he had witnessed only a handful of times. "Thank you for coming, Auron." Gradually Auron's eyesight acclimated to her present reality. There was no sky, only a blindness when the eye strayed upward. It had more of a quality of darkness than light, but that was only a matter of interpretation, like those riddle-glyphs that could be a cup or two faces in silhouette. He recognized the profile of Mushroom Ridge in the bluffs behind her. He lay on a ghostly facsimile of Djose Beach, its battle-scarred humps and hillocks overrun by ivy, trailing creepers, pungent rosemary, spears of tropical plants with sword-shaped leaves, purple hibiscus and luminous moon-lilies, and the crystalline spikes of Macalania trees. Everywhere, in burgeoning profusion greater than all the rest, grew sprays of ghost-white roses fringed with salt. Blanketing this landscape like a mirage was a field of wavering flames, dancing from red to blue and back again, burning without consuming Sin's unholy garden. A gentle rain was falling. Now and again a spiderweb of lightning rippled across the bluffs. "No snow," Auron observed, watching Lulu's pleased smile broaden as he surveyed her handiwork. "Silly." She leaned across him and snapped a twig from a Macalania sapling, tracing his cheek with its icy tip. He shivered at a memory: the mage used to apply her elemental magics in the most wicked ways. But the clink of the manacles binding her wrists snapped him back to the present. He sat up with a scowl and closed his fingers around the metal cuffs, giving the short length of chain between them an experimental tug. Lulu shook her head, face tranquil and remote. "It's easier now. The more I yield to him, the fewer the chains. I'll be free soon." "Not that way," Auron said forcefully. "Shhh." She raised her hands to his face, palms barely grazing his stubble. "Rest now. Walk with me in my garden, Auron. We'll fight soon enough." They stood up together. Lulu plucked a cluster of roses and clasped them before herself in a demure feminine gesture that reminded him of Yuna. Casting off the left side of his coat as he did going into battle, Auron fell into place beside her. "After you." She glided off. "Watch your step." Bones hidden by the dark vegetation crunched underfoot as they strolled side by side. Gray stones poked up through the green carpet at staggered intervals. Each marker was carved with a single name. Auron recognized some of them. "You've been busy," he said. Lifting his line of sight, he saw that this beach was infinitely more vast than the one at Djose where a generation of Crusaders had died. The tangled carpet of plants spread out as far as darkness permitted the eye to roam. 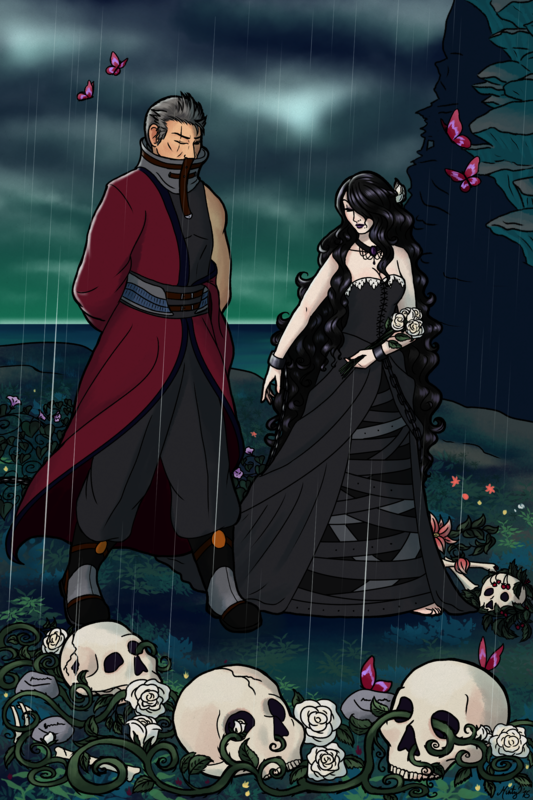 Sin's graveyard garden spanned the whole ocean. "They're not all mine," Lulu said, white feet stepping daintily over a skull netted in wild strawberries. "Most are my predecessors' victims. I've been using my leisure to learn all their names. Spira tries so hard to forget the dead; someone ought to remember them all." Her hand brushed against his shoulder. The bare touch made Auron flinch. The sleeping forces in her flesh were dangerously palpable now that Sin's power augmented them. Auron ignored the pleasant ache, as he often had in the last days of their pilgrimage. "You never wasted time on regret," he reminded her. "You said it was 'pointless to think about, and sad.'" "That was when I had something to live for." She shrugged. "Sin can't regret much, Auron. It's simple acknowledgement. Death is who I am. And I have a great deal of time on my hands, these days." Auron was content to let her lead him in an aimlessly meandering path. A few butterflies flickered past. She steered him around the red ones with a scolding glance, as if to say, Have you forgotten? Finally, Lulu stopped before a bare stone leaning against another that vines had nearly covered. She bent to place the bouquet of roses on the empty marker with care. Crackling like brittle slate, a pair of glyphs appeared and chewed into the stone's flesh beneath her hands. "Hardly a match for the bouquet he gave me," she said. "I shall have to try to capture its color. I forgave Luzzu long ago, you know." Auron grimaced. "He said you sent Wakka away. Where is Wakka now?" She looked up, mouth setting into a thin line. "I'd rather not tell you, Auron." Her expression grew more peevish as he burst out with a dry, rolling laugh. "What?" she snapped. "Nothing," he said, smirking under her baleful glare. "I missed you. Lulu, I want to talk to him." "He doesn't want to talk to you." She chewed her lip, turning away from the tombstone. "I don't want to get him involved, Auron. And I don't think it's wise for you to seek him." "Wisdom and strength won't solve this, Lulu. Otherwise you'd have succeeded, and Yuna would still be alive. We need something else. Something he knows better than I." She looked up in astonishment, expression softening to tenderness. "You underestimate yourself, Auron. Besides, I loved Yuna more than my own life. That is, after all, the error all true guardians make—"
Her chin lifted. "Ah." She went quiet, withdrawing into herself and considering. Auron waited. Finally, she gave a minute nod and began to walk again, expression now preoccupied. For a while he savored the silence, the eldritch beauty of the garden of death and its sole occupant, the simple act of walking without direction. Her wild mane brushing against his arm brought back memories of moments beyond words when she had showed him a glimpse of the life he'd missed. But there were still questions he ought to ask, and the queasy feeling in his stomach told him this timeless dream would end soon. "Lulu. Why is Yu Yevon destroying the temples?" "That is not his doing." Her eyes flashed and her pace quickened. "He cares not what I do, so long as he endures. Although he likes it well that Spira has begun to worship Sin. If I am strong enough, he may be content to keep me a long time. "No, I wiped out the temples. Not for myself, but for Yuna's sake and Kimahri's, and for Lord Braska and Sir Jecht and his son, and for you, too, Auron— for you most of all. Yevon banished and dishonored you in life, then made a hero of you in death. It did the same to Yuna. I mean to make Yevon atone for its crimes! "It's vengeance, Auron, and nothing else. When I am done, Yuna's Final Aeon will be the last, Sin will be eternal, and that cowardly religion will have crumbled under the weight of its own lies. You ought to help me, you know." She looked up at him, and for a moment a different note came into her voice: a ghost of a plea behind the cold pride. "Help me." Auron turned towards her, searching her face that seemed now more like an image of graven bone. The world had been growing hazy as she spoke, obscured by a glowing mist like Farplane clouds. His time was almost up. Auron took her hands gently and raised them to his lips, thumbs resting on cold metal. "I will." Her true smile reappeared. "I know you will. Please give Wakka my love—"
At her final word, the golden light grew unbearably bright. Heat washed over him as the dream-world burned away. I heard you, Lulu. I hope Yu Yevon didn't. Auron awoke on burning sand. As his eyes acclimated to the real world, he realized there was no fire, only blazing sun. He sat up, numb limbs still jangling from lightning's kiss. The wastes of Bikanel were a jarring change from Lulu's midnight garden, but anything was better than Zanarkand, where he had feared Wakka might be. Twisting around to get his bearings, he spotted a glint of green between the dunes. Auron rose and headed towards it. Cresting a dune, he gazed down in astonishment. The outline of the oasis' rocky pool was unchanged, but the spindly desert plants around it had been replaced by a garden more lush than the one he had just left, exuberantly alive and full of vibrant color. There were flowers, there were vines, there was even grass in the desert, winking with tiny blue blossoms. A grove of fruit trees scaled the dunes beyond. He saw oranges, figs, other fruits vaguely remembered from a mission to the islands west of Bevelle. Stumbling forward, he felt a pop and looked down to find he was trampling on squash. "Hey!" That was not Wakka, but the youthful voice sounded familiar. "Watch where you're goin', mister!" "Sorry," Auron said, looking around for the speaker. His legs were still not working properly. Before he could correct his balance, he toppled down the slope. Crashing through rows of melons, string beans and beets, he fetched up against one of the only remaining cactuses in the oasis. He wasn't sure how, but he thought petulantly that even that was part of Lulu's design. She had a discerning knack for detail. A squeal had punctuated his fall. Auron found himself squinting up at a heart-shaped face and a pair of mismatched eyes, green and brown. Peering down at him under a mop of strawberry-blond hair, the child puckered her lower lip and tilted her head in a manner he recognized at once. "Hi!" she said brightly. "Where're you people comin' from?" Auron was not the least surprised when an older boy sporting a flame-red crest yanked her back with a sharp, "Yunie!" "Hey!" she said, pawing at him. Seven and nine, Auron guessed, opting to lie quietly and let Lulu's design play itself out. He started to reconsider when the boy planted a sandaled foot on his throat. "Get Pops," the boy said, glaring down at Auron. "Vidina, stop it! It's not nice to step on people!" At least the boy did not weigh very much. "We don't know who he is, Yunie. Go get Pops. He might be a Yevon." "I think he's a nice man," the girl said obstinately. "Look, he wears red too." She tugged at Auron's sleeve. "What's your name, mister?" His collar had saved him from choking, but he was hardly in a position to answer. Luckily, the voice he was waiting for cut short debate. "Yunie? Vidina? What are you two up to, eh? You better not be messin' with Mum's tomat—"
Auron could not see much from his current position, but he had a good idea of the man's expression. Eloquent as ever, Wakka. Auron could almost hear Lulu's voice in his ear. Pinned under a child whose father might take any sudden moves amiss, he lay still and counted seconds. The explosion was not long in coming. "Get the HELL away from him!" Spluttering, he bounded towards them. "Vidina! Take your sister back to the house, quick! You tell Mum to close that door and don't let anybody in except me, ya?" Vidina caught his sister's hand, craning his head to watch as he started dragging her away. Auron coughed and massaged his neck, sitting up gingerly. Wakka was charging around the pool like an enraged dual-horn. The gun he carried was nearly large enough to fire blitzballs. "Don't you move," Wakka said, planting his feet and hefting the barrel onto his shoulder. "Vidina, what you waitin' for? Get going, both of you. I mean now." "I don't wanna hear it!" Wakka said, clenching his teeth to keep from shouting. His eyes darted after the children, watching them scamper away. He waited until the sound of their footsteps had dwindled, then took aim. "I don't know why you came here, but I'm not gonna let you screw up my family. Weren't Lu and Yuna enough? Rikku's gonna be mad at me, and I guess I'm sorry, but I'm gonna do what I shoulda done thirteen years ago." Auron heard the click of a safety catch being released. On the whole, he reflected, it was best to heed the counsel of black mages. I am utterly stunned and grateful to mintywolf and cumuluscastle for their fanart of this chapter. Here's the full-sized version of Mintywolf's "Walk with Me" which she kindly colored/enhanced for the LHAD remaster, and the b&w original. I'm saving CumulusCastle's Lulu's Garden as a header for a later chapter. Y'all are too good to me. Chapter renumbering: This was originally chapter 16, posted Nov 2008. Angry on behalf of Yuna... but as you'll soon see, Wakka has even more reason to be angry/fearful of Auron's intrusion. Btw it is just the Mushroom Rocks in the background. (The same view as in the poster image of Lulu and Yuna actually.) There’s a lot, visually, going on in this scene and I tried to incorporate as many elements as I could but I couldn’t fit everything in. This is my third reading of your story and yet somehow I previously missed the very subtle hints that Auron and Lulu’s relationship had an actual physical component while they were on the pilgrimage? I think I was under the impression that they had just been tacitly coveting each other from afar the entire time or something. I imagine they’d have to have been secretive about it. This is purely speculation on my part, but it seems likely that romance between guardians would be a Yevon taboo, officially or unofficially, to prevent conflicts of loyalty between a guardian’s object of affection and their summoner. FISTICUFFS IN THE PARKING LOT... indeed. NOTPs are fine; hating Lulu is FOOLISH. I knew it was Mushroom Rock, but the particular way you did the shadows reminded me a little of the classic cup/faces image, playing with negative space. However, I'd missed it really WAS the poster's cliffs, ha. Yeah, I'm enamored of what-ifs, both the threads I follow and the ones I don't. Lulu would've been a better nun than Auron was a monk, really. And yes, Auron's forgotten what put it into his head, but he's subconsciously remembering the broken cradle he stumbled over outside Lulu's hut (or the hut that replaced hers when she didn't come back). The cradle is Symbolic (tm) of one of Lulu's possible futures, had she not become Sin. While the main what-if of LHAD is, "What if Yuna had chosen the Final Summoning?" there was always a secondary: "What if Sin isn't just an old friend, but an old lover one must kill to free them?" That's a tasty layer of angst in keeping with FFX never letting our heroes have Nice Things. However, I tend to be circumspect in referencing any physical relationship between Lulu and Auron, because they strike me as profoundly private people (and my own tastes run to courtly rather than ribald). Plus I know it's not a ship that everyone enjoys, now that the other fans of that ship have stopped being active. However, the ship stories I wrote during the Aulu community's heyday were in the back of my mind when I started writing LHAD, and they remain in its backstory. Chiefly the oneshot in which Lulu, having added Auron to her "list" for the challenge as much as anything, propositions Auron with, "Do you suppose one of us could make the other feel like one of the living?" At which he is taken aback, but gives into temptation. I have a thing for the Memento Mori trope— live life fiercely, for tomorrow we may die. But as you say, Lulu and Auron are absolute professionals who would never allow the personal to interfere with their guardian responsibilities. They would only drop their guard at very rare moments when Yuna was protected by Kimahri and/or Rikku and 500% secure (in travel agencies, for example). Nor are they likely to let private lives slip out in public. *I don't see a conflict in people loving more than one person, although it's exceedingly rare for them to love different people the same way.